We are recognized as the industry leaders by developing finest grade 1/2" Inch UPVC Pipes SCH 40. We are providing the premium range of pipes that ensure hygienic water supply. These non toxic pipes are utilized widely at homes and hospitals for potable water distribution hence we make sure to procure the industry compliant grades of UPVC compounds. Further, the industry confirming range of SCH class UPVC pipes is accessible from us in varied wall thickness at a nominal price. We have attained wide reputation in the market by developing best quality 3/4" Inch UPVC Pipes SCH. 40 Our prestigious clients can ensure hygienic supply of cold and hot water with our offered UPVC pipes. These light weight and easy to install pipes are suitable for hotels, hospitals, residential apartments and high and low rise buildings. Fabricated precisely at our well integrated setup these pipes are tested under strict quality supervision. Further, we procure premium grade UPVC compounds and develop the industry compliant range of these pipes in varied pressure ratings. We are reckoned as major entity actively engaged in developing high quality 1.1/2 Inch UPVC Pipes SCH 40. Our esteemed patrons can avail the industry compliant range of easy to install pipes for both hot and cold water distribution applications. We make sure to procure the premium grade raw materials to develop fire retardant and eco friendly pipes. Further, these pipes undergo strict quality supervision to ensure its SCH class compliant ratings and cost efficiency. We have attained a wide reputation in the market by developing best quality 1/2" Inch UPVC Pipes SCH. 40 Our prestigious clients can ensure hygienic supply of cold and hot water with our offered UPVC pipes. Fabricated precisely at our well integrated setup these pipes are tested under strict quality supervision. Further, we procure premium grade UPVC compounds and develop the industry compliant range of these pipes in varied pressure ratings. We have attained a wide reputation in the market by developing best quality 3/4" Inch UPVC Pipes SCH. 40 Our prestigious clients can ensure hygienic supply of cold and hot water with our offered UPVC pipes. These lightweight and easy to install pipes are suitable for hotels, hospitals, residential apartments and high and low rise buildings. Fabricated precisely at our well-integrated setup these pipes are tested under strict quality supervision. Further, we procure premium grade UPVC compounds and develop the industry compliant range of these pipes in varied pressure ratings. We have attained wide reputation in the market by developing best quality 1.1/4" Inch UPVC Pipes SCH. 40 Our prestigious clients can ensure hygienic supply of cold and hot water with our offered UPVC pipes. These light weight and easy to install pipes are suitable for hotels, hospitals, residential apartments and high and low rise buildings. Fabricated precisely at our well integrated setup these pipes are tested under strict quality supervision. Further, we procure premium grade UPVC compounds and develop the industry compliant range of these pipes in varied pressure ratings. We have gained huge success in developing high in demand 1 Inch UPVC Pipes SCH.40 Our offered range of SCH class UPVC pipes are demanded widely for potable water supply in residential and commercial sectors. The offered range of pipes is confirming to the highest industry standards as we make sure to procure best suited inventory of raw materials and implement the innovative product manufacturing techniques. Further, our prestigious clients can avail these pipes in 25mm size at a market leading price. We are reckoned as major entity actively engaged in developing high quality 1.25 Inch UPVC Pipes SCH 40. We have attained wide reputation in the market by developing best quality 2" Inch UPVC Pipes SCH40. Our prestigious clients can ensure hygienic supply of cold and hot water with our offered UPVC pipes. We have attained wide reputation in the market by developing best quality 1.1/4" Inch UPVC Pipes SCH. 80 Our prestigious clients can ensure hygienic supply of cold and hot water with our offered UPVC pipes. These light weight and easy to install pipes are suitable for hotels, hospitals, residential apartments and high and low rise buildings. Fabricated precisely at our well integrated setup these pipes are tested under strict quality supervision. Further, we procure premium grade UPVC compounds and develop the industry compliant range of these pipes in varied pressure ratings. We have attained wide reputation in the market by developing best quality 1.1/2" Inch UPVC Pipes SCH. 80 Our prestigious clients can ensure hygienic supply of cold and hot water with our offered UPVC pipes. 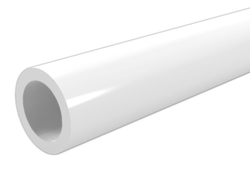 We have attained wide reputation in the market by developing best quality 1.1/2" Inch UPVC Pipes SCH. 40 Our prestigious clients can ensure hygienic supply of cold and hot water with our offered UPVC pipes. We have attained a wide reputation in the market by developing best quality 2" Inch UPVC Pipes SCH. 40 Our prestigious clients can ensure hygienic supply of cold and hot water with our offered UPVC pipes. Fabricated precisely at our well-integrated setup these pipes are tested under strict quality supervision. Further, we procure premium grade UPVC compounds and develop the industry compliant range of these pipes in varied pressure ratings. We have attained wide reputation in the market by developing best quality 1" Inch UPVC Pipes SCH. 40 Our prestigious clients can ensure hygienic supply of cold and hot water with our offered UPVC pipes. These light weight and easy to install pipes are suitable for hotels, hospitals, residential apartments and high and low rise buildings. Fabricated precisely at our well integrated setup these pipes are tested under strict quality supervision. We have attained a wide reputation in the market by developing best quality 1" Inch UPVC Pipes SCH. 80 Our prestigious clients can ensure hygienic supply of cold and hot water with our offered UPVC pipes. These lightweight and easy to install pipes are suitable for hotels, hospitals, residential apartments and high and low rise buildings. Fabricated precisely at our well-integrated setup these pipes are tested under strict quality supervision. Further, we procure premium grade PVC compounds and develop the industry compliant range of these pipes in varied pressure ratings. We have attained wide reputation in the market by developing best quality 1/2" Inch UPVC Pipes SCH. 80 Our prestigious clients can ensure hygienic supply of cold and hot water with our offered UPVC pipes. We have attained a wide reputation in the market by developing best quality 3/4" Inch UPVC Pipes SCH. 80 Our prestigious clients can ensure hygienic supply of cold and hot water with our offered UPVC pipes. These light weight and easy to install pipes are suitable for hotels, hospitals, residential apartments and high and low rise buildings. Fabricated precisely at our well-integrated setup these pipes are tested under strict quality supervision. Further, we procure premium grade UPVC compounds and develop the industry compliant range of these pipes in varied pressure ratings. We have attained a wide reputation in the market by developing best quality 2" Inch UPVC Pipes SCH. 80 Our prestigious clients can ensure hygienic supply of cold and hot water with our offered UPVC pipes. Looking for UPVC Plumbing Pipes ?